Foreign Affairs Minister Chishimba Kambwili has dispelled the story on MUVI TV and the Zambian Watchdog that President Michael Sata caused commotion during the summit in Kampala by failing to follow protocol just before the summit began. Kambwili told the PF government propaganda news agency, ZANIS , that Muvi TV must withdraw the story and apologise to Sata. He said the Watchdog is a UPND cyber outlet. 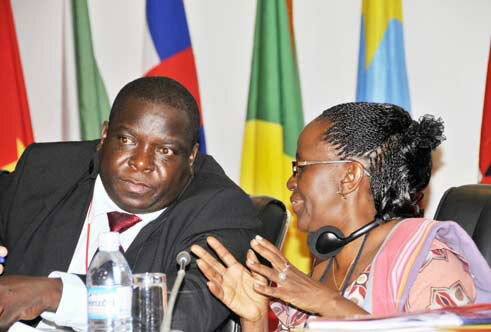 Kambwili dragged along Kampala’s minster of foreign Affairs Henry Okello to his press conferenne. Kamwbili said he was disappointed with MUVI TV for airing what he described as a malicious story without getting government’s side of the story. Kambwili said MUVI TV knew his mobile phone number and should have verified the story with him before airing it. The minister said it was the policy of the PF administration to liberalise the airwaves, but warned that inaccurate reporting shall not be condoned. Kabwili said he knew that the Zambian Watchdog was a UPND cyber outlet which he said survived on fabricating stories against the PF including when they falsely accused him of grabbing land from the church two weeks ago. And Ugandan Foreign Affairs Minister Henry Okello described the story as a total fabrication, misleading and despicable to the Zambian Head of State. He said President Michael Sata was highly respected by the Ugandan President Yoweri Museveni and the people of Uganda. He said President Museveni was highly appreciative of President Sata’s visit to Uganda and that was why he received him with so much esteem. He said as Minister of Foreign Affairs he had been present throughout the summit and any responsible media should have sought audience with him before reporting the false story, adding that it is such small things that lead to unnecessary diplomatic tension. On December 15, 2011, President Michael Sata caused drama at Speke Resort Munyonyo in Uganda after he defied the orders of the Ugandan protocol officials to follow security routine. Sata is in Uganda to attend the International Conference for the Great Lakes Region (ICGLR) heads of state summit. Sata who arrived at the summit an hour before his host President Yoweri Museveni, was approached by the protocol with intentions of leading him to the VIP seats. But in his usual chaotic conduct, he snubbed them and went to greet and chat with Zambians who have gone to the meeting. Sata told the Ugandan security to get in touch with their head of protocol. “Go and see the head of protocol, am greeting my fellow countrymen,” he shouted at them.